Iguanas are an invasive species in Florida and experts have seen an increase in population over the last several years. Whether it's to help with population control, or if people just find them down right tasty, reports have been popping up across the state about people eating iguanas. South Florida resident Brittany Peters is one of those people. "I like to promote eating what you harvest and know a lot of people kill iguanas since they are a nuisance, and I wanted to cook and eat them hoping to encourage those who kill them to also eat them," she told ABC Action News. Hunting and eating green iguanas is a cultural practice for many countries in South and Central America. According to National Geographic , the species has been declared endangered in some countries because they have been eating the iguanas for such a long time. Iguanas are referred to as the "chicken of the trees," by iguana eaters, because they are said to taste like chicken. Many people enjoy the meat from iguanas because of the high levels of protein it provides. In fact, iguana is a pretty lean meat and contains more protein than chicken. It's legal to kill iguanas in Florida, but state law requires that the killings be done in a humane manner. Experts recommend shooting iguanas with pellet guns, stabbing them in the brain, or decapitating them without having them suffer. As for cooking them... You can fry them, roast them, boil them, skewer them, or even deep fry them. 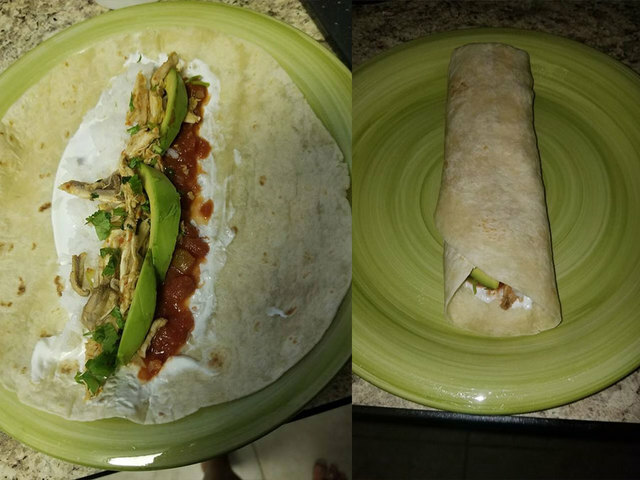 Peters sauteed the meat with onions and chives, then paired the meat with avocado, sour cream, and salsa to make a burrito. "I tried not to go too heavy on seasoning as I wanted to taste the iguana. It was a little more bland than I typically eat, and will add more spice in the future," she said. So if you're looking for a different way to get rid of the invasive species in your yard, you might consider this option.